LITTLE RED CABOOSE, CHUG, CHUG, CHUG! My generation saw few very little red cabooses, but when we did, it was a majestic and memorable sight to behold. There was just something magical about those rail cars and the mysteries they held. 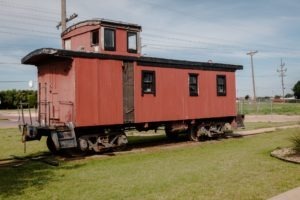 As manager of the Slaton Harvey House Bed & Breakfast and Event Center, I have had many conversations with people about their memories of trains and train travel. With an enchanted sense of nostalgia, they reminisce… and their memories are almost always fond ones: eagerly anticipating the powerful engine pulling the train into the station; the conductor yelling “all aboard!”; stepping up onto the metal stool that put them into a “time travel machine” that whisked them from Slaton to Amarillo and back home again. As I imagine each memory shared, I always envision the same scene. There is a platform bustling with families in suit coats and long dresses. There are children carrying small, hard luggage cases as they excitedly await the train. There is a powerful steam engine — like the majestic “1809 Cotton Special” that graces the Slaton Square lawn — steam bursting and whistle blowing. And there — seemingly pushing the train along the track as it pulls out of the station — is the little red caboose. No train illustration is complete without it. No movie involving a train would dare leave it off. Each of us, even those who have never seen a real-life caboose can envision it… a train pulls out of the station and the hero runs to the back, hanging dangerously off the caboose handrails, declaring his undying love to the maiden who weeps and waves goodbye from the platform, handkerchief in hand. The caboose is romantic. It is nostalgic. It is surely one of the most iconic pieces of our nation’s history. It holds memories of the brakemen who looked out the cupola window, perched like birds, watching the train ahead for any sign of trouble. It represents an era of change, of travel, of civilization, and, for many, the heartache of watching the train lug their loved ones away. In some ways, it represents a beginning. In other ways, it symbolizes the end. 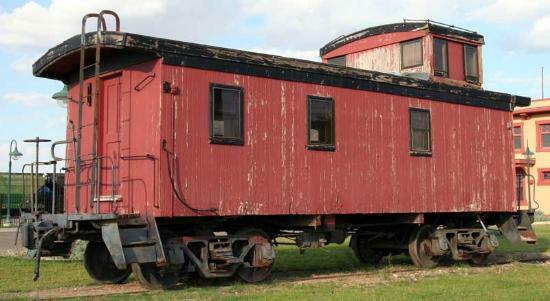 I feel fortunate to look out the window each day to the wooden caboose that adorns the Harvey House lawn. It is truly a magnificent piece of history, and I look forward to its approaching restoration, so that all can see the beauty of an artifact that played such an important role in the establishment of our country. Little Red Caboose behind the train, train, train, train. Going down the track, track, track, track. Little Red Caboose behind the train! 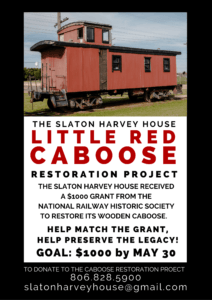 To donate to the restoration of the historic and rare red caboose, please call or email the Slaton Harvey House: 806-828-5900, slatonharveyhouse@gmail.com. The Slaton Harvey House, a landmark Santa Fe Railroad facility built in 1912, was part of a chain of eating rooms created by Fred Harvey in 1876. The kitchen staff and hostesses — known as Harvey Girls — provided fine dining to passengers and townspeople alike for more than 30 years. The two-story Mission Revival structure features concrete walls a foot thick and a parapet decorated with Santa Fe Railway symbols. 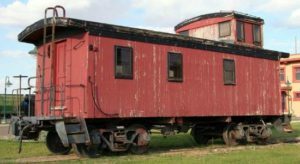 Today, the Slaton Harvey House has been restored to its former status as host to travelers, providing bed and breakfast service and an archive of Slaton’s railroad heritage artifacts. The beautiful building also serves as an intimate event center for meetings, conferences, and receptions.